In honor of Martin Luther King, Jr. Day and the 50th anniversary of the Selma to Montgomery Voting Rights March, we are proud to present this Road School article on teaching your children about the Civil Rights Movement through travel. Why Teach Your Kids About the Civil Rights Movement? While researching this article, I happened upon the 2015 Golden Globes. Co-hosts Amy Poehler and Tina Fey, two of my favorite comedians of all time, opened the show with a variety of pokes and prods at both the celebrities and the films they produced this past year. But the most poignant pun, in my humble opinion, was aimed at the creators and stars of Selma, a critically-acclaimed dramatization of the 1965 Civil Rights Movement voting rights march from Selma to Montgomery, Alabama. In Fey’s own words, “Selma is about the American Civil Rights Movement that totally worked and now everything’s fine.” The joke garnered plenty of laughs because we know that everything is not really fine. The American Civil Rights Movement is important to impress on our children, not because it was something phenomenally important that happened in our past, long before our kids were born, but because racism and its terrible effects continue to plague our society. Although we have made strides, as a nation we are still haunted with an elusive dream of equality. From class disparity to immigration laws, to social inequality and even open and often un-prosecuted racism, we still have a long way to go. Nelson Mandela once stated that “education is the most powerful weapon which you can use to change the world.” By teaching your kids about the history of the civil rights movement, positive, lasting changes can be made. Dr. Martin Luther King, Jr. himself said, “I refuse to accept the view that mankind is so tragically bound to the starless midnight of racism and war that the bright daybreak of peace and brotherhood can never become a reality… I believe that unarmed truth and unconditional love will have the final word.” Let’s teach our kids truth and unconditional love. Wondering where to start? 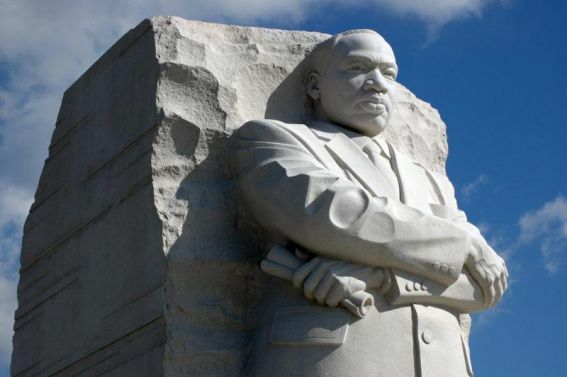 Take your kids to these Civil Rights Movement monuments, museums, and historic sites, mostly located in the southern U.S.. Your travel adventures can be a catalyst to education and real change. Begin the conversation with them about our nation’s past and present to engage their critical thinking skills, even from a young age. Tip: Preparing your kids in advance for a visit to these parks and museums will help their understanding. Don’t miss our age-appropriate resources at the bottom of this article. Little Rock Central High School, a still working high school that is now a National Historic Site, was the scene of the 1957 Desegregation Crisis where the “Little Rock Nine,” nine African American students who had enrolled at an all-white school, fought through the battle of desegregation with the help of President Eisenhower. The student’s persistence and story of the implementation of the Brown v. Topeka Board of Education decision is on display for visitors as they explore the school through guided tours led by Park Rangers. The visitor center, located across the street from the school, features interactive exhibits, audio-visual programs, and oral history listening stations where kids can learn first-hand from the crisis’ participants. The Commemorative Garden offers both a photo collage of the school’s history and a quiet place for reflection. The Jr. Ranger Program is available for kids age 9-12. Download a copy of the Jr. Ranger Activity Booklet. Visiting Tip: Reservations are recommended for school tours, which often fill up weeks before visiting. 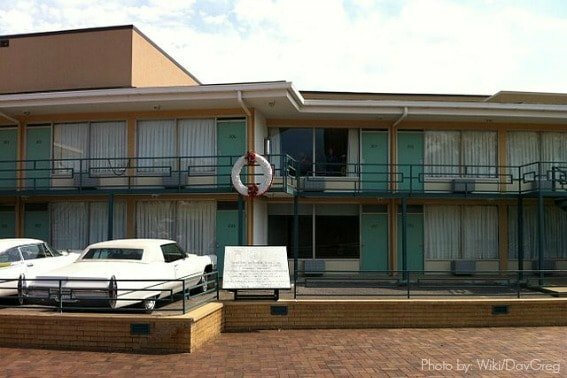 Located at the Lorraine Motel in Memphis (the assassination site of Dr. Martin Luther King Jr.), The National Civil Rights Museum, chronicles key episodes in the American civil rights movement and aims to inspire its visitors (including kids) to participate in civil and human rights efforts globally. The permanent exhibits of the museum are recommended for kids over the age of 12, but an in-depth Family Guide is available that helps prepare both parents and young kids for the content in the museum, which includes images and videos of assassinations, police brutality, lynching, and offensive language. The guide includes the exact locations of particularly graphic content so that parents can navigate through the museum properly. Visiting Tip: Don’t forget to download a copy of the museum Family Guide before visiting. This small pamphlet is integral to preparing your kids for a visit through this museum and includes questions to discuss as a family. Civil Rights Movement History in Washington, D.C. The Martin Luther King, Jr. Memorial, located on the National Mall in Washington, D.C., exhibits a beautiful statue of Dr. Martin Luther King, Jr.. Onsite Park Rangers help explain the life and legacy of Dr. King to families and kids, and readers in the family can read and be inspired by excerpts of MLK’s speeches. The Jr. Ranger Program is available for kids age 5-12, but it does focus on the National Mall as a whole, with only a brief mention of The Martin Luther King, Jr. Memorial. The 1954 US Supreme Court case, Brown v. Board of Education, proved one of the most pivotal in the civil rights movement. 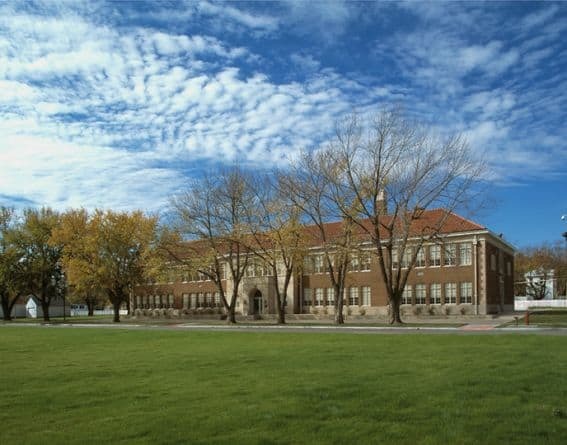 The Brown v. Board of Education National Historic Site commemorates the Supreme Court decision that overturned the “separate but equal” precedent, desegregating the nation’s schools. The historic site includes a 30-minute film, “Race and the American Creed,” that follows a young girl’s quest for freedom and equality as she learns of our nation’s history of racism and segregation. Additional exhibits include The Five Lawsuits exhibit, The Struggle Continues, a timeline wall, and “The Kindergarten Room,” restored to its 1954 appearance. An in-depth Jr. Ranger Program is available for kids age 5-12, and includes a special video (Fair is Fair) for kids in grades Kindergarten to 3rd grade to help them process the importance of this moment in the civil rights movement. Visiting Tip: The Hall of Courage, which displays historic film footage, is recommended for kids 12 and up. The Martin Luther King, Jr., National Historic Site boasts a number of facilities available for families seeking to broaden their depth of knowledge on the civil rights movement, and on Dr. King himself. Visitor Center: The first stop in your tour of this historic site, the visitor center provides a brief introduction to the site’s offerings and tours. Don’t miss the “Children of Courage” exhibit here, telling the story of the children of the Civil Rights Movement and a call to action for kids today. “Freedom Road” and “Courage to Lead” are two other great exhibits located in the visitor center. Peace Plaza: Includes the “I Have a Dream World Peace Rose Garden” where local Atlanta students shared their messages of peace, as well as the “BEHOLD” statue. Birth Home of Dr. Martin Luther King, Jr.: Tour inside of the home where Martin Luther King, Jr. was born and raised (he lived here for the first 12 years of his life). Considered by many to be the highlight of the historic site, the ranger-led tour shares the early days of the King family. Taking the guided tour of Dr. King’s birth home is the only way to step inside this historic building. Reservations for tour tickets are not available; first-come, first-serve ticket distribution begins each morning at the Visitor Center and tours fill up fast. Ebenezer Baptist Church: The church where MLK, Jr. was baptized and ordained as a minister, Dr. King remained in a position of co-pastor at this church until his death in 1968. The church is currently in restoration process, but is still accessible on most days. International Civil Rights Walk of Fame: Created in 2004, this display honors heroic “soldiers of justice” featured on granite markers boasting the footprints of human rights icons such as Rosa Parks, Desmond Tutu, and more. 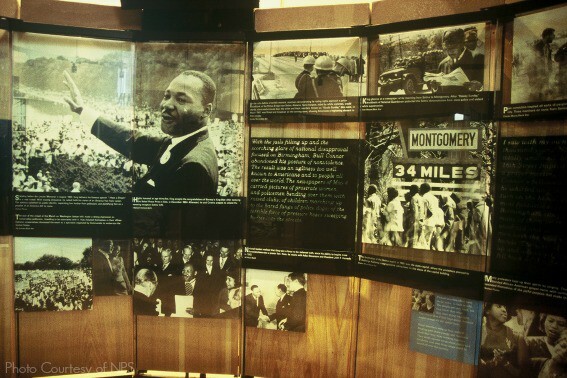 The King Center: Created to preserve the legacy of Dr. Martin Luther King, Jr., this museum features photographic and interactive artifact exhibits on Dr. King, Jr., Coretta Scott King, Rosa Parks, and Mahatma Gandhi, and also serves as the final resting place of Dr. King. The Jr. Ranger Program is available for kids age 9-12. In addition to the standard Junior Ranger Promise, all Junior Rangers must also agree to live by Dr. King’s Six Principles of Nonviolence to earn their badge! Visiting Tip: If you are flying into Hartsfield-Jackson Atlanta Airport, ask to see the King Center exhibit located on property! The Selma to Montgomery National Trail commemorates the “events, people, and route of the Selma to Montgomery Voting Rights March of 1965” and serves as a reminder of the rights and responsibilities that all Americans have to participate in the election process. Plan on stopping at a variety of spots along Highway 80. In addition to markers along the route explaining various events that took place in the march, there are quite a few museums, locations, and interpretive centers that provide detailed and hands-on information. The trail ends in Montgomery at the steps of the Alabama State Capitol, the site of Dr. Martin Luther King, Jr.’s address on voting rights for all. Selma Interpretive Center: The Selma Interpretive Center is a great starting point for your journey. This Welcome Center features a 25-minute film, a bookstore, and various exhibits. Martin Luther King, Jr. Street Walking Tour: This walking tour includes stops at Brown Chapel A.M.E. Church (the official starting point of the 1965 march), First Baptist Church (where the Student Nonviolent Coordinating Committee planned the march), George Washington Carver’s home, and other historic locations. National Voting Rights Museum: Although privately operated, the National Voting Rights Museum, located at the foot of the Edmund Pettus Bridge, chronicles the right to vote, from the Founding Fathers through women’s suffrage and the Civil Rights Movement. Edmund Pettus Bridge: Walk across Selma’s Edmund Pettus Bridge, the site of the 1965 violent confrontation that helped rally national support for the Civil Rights Movement. It was here that the voting rights marchers were violently attacked by law enforcement, a day now known as Bloody Sunday. Lowndes County Interpretive Center: In the middle of the 54-mile trail, at the site of the historic “Tent City,” be sure to visit the Lowndes County Interpretive Center. Numerous civil rights events are documented in the museum including a thorough understanding of Tent City, the confrontation of Jonathan Daniels, and the slaying of Viola Liuzzo, a white woman assisting the Selma marchers. The Selma to Montgomery National Historic Trail Jr. Ranger program is designed for visitors between the ages of 6-12. Visiting Tip: While in Montgomery, don’t miss a stop at the Dexter Parsonage Museum, the home or Martin Luther King, Jr. during the Montgomery bus boycott, or the Freedom Rides Museum, showcasing how the Freedom Riders used non-violence to change history. The Civil Rights Memorial Center is a great place to conclude your Montgomery Civil Rights tour, little kids will love the fountain and older children can sign a pledge to promote racial justice at the Wall of Tolerance. The nation’s largest civil rights museum, Birmingham’s Civil Rights Institute, boasts 58,000 square feet of archives, galleries, and exhibit spaces covering the Civil Rights Movement of the 1950s and 1960s to human rights struggles of today. 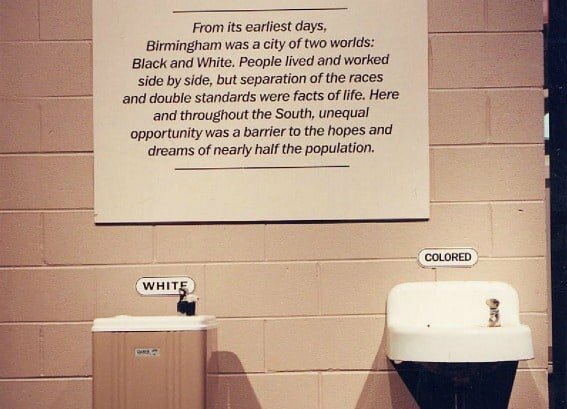 The Barriers Gallery confronts families with the inequities of segregation as they see a recreated cityscape with “whites-only” signs on drinking fountains, soda shop counters, and more. Kids can walk on a bus to see where they could sit in this era. A variety of state-of-the-art exhibits integrate images, video, audio, and hands-on learning. Visiting Tip: While in Birmingham, don’t miss a visit to Kelly Ingram Park and the 16th Street Baptist Church, where Ku Klux Klan members killed four young girls in a 1963 bombing. Before visiting any of these Civil Rights Movement sites, it would be especially helpful to prepare your kids. 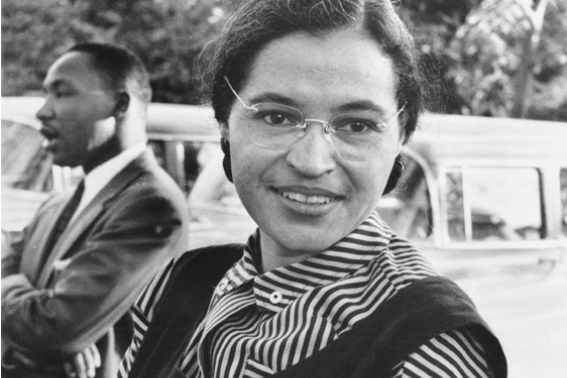 The following educational resources will help give your kids context to civil rights movement history before they arrive. Don’t skip out on the Jr. Ranger programs at National sites; they offer invaluable resources for your children’s understanding, and are already age-appropriate. All photos not attributed are public domain or courtesy of the National Parks Service. This is an awesome roundup Katie. Living in the South my whole life I’m well versed on these important monuments. The National Civil Rights Museum is one of the most important treasures in the city of Memphis. I’m looking forward to revisiting since they reopened in April 2014 with what is supposed to be an awesome renovation that updated all the technology in the exhibits.